The Bee has been really into air dry clay lately (a post for another day) so we haven't played with play dough in a while. The other day the girls asked about play dough and when I took it out all we had left was our kool-aid play dough. Which was fine and the girls were more then happy to happy to use it but to me it seemed so oddly out of season. I know that is a weird thing to say, play-dough is play-dough, but it had such a summery kool-aid smell it seemed weird. So I decided we needed to make a more seasonally appropriate play dough, which the girls were also more then happy to do. And what is more seasonally appropriate the day before Thanksgiving then pumpkin pie. 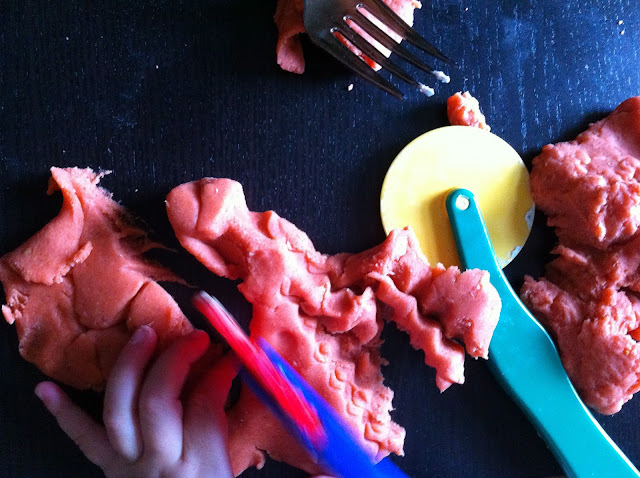 With just a little orange food coloring and a few teaspoons of pumpkin pie spice added to our normal play dough and we had a perfect fall smelling dough. Add all the ingredients to a large sauce pot and stir over medium-high heat for 5-10 minutes until the dough is formed. Take out to let cool then knead a little before playing.